JULIA SPENCER-FLEMING: January first, 2018. Has there ever been a time when this many people have been so glad to turn the calendar page and start a new year? I don't know about you, but 2017 felt like one long, exposed raw nerve to me. Thank heavens we have the ritual of New Year's Day, a pause in the rush of time, a clean, unmarked sheet of paper. 2017 is done, it's behind us, and we have 365 days waiting, pristine and unopened, to get things right. To do things better. To vote in the midterm elections. (Ha! Sorry, we try to be apolitical here on JRW, but I couldn't resist.) 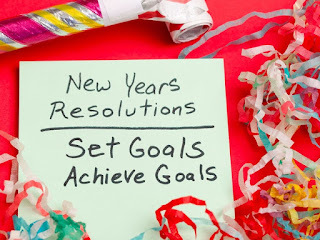 So, Reds, it's time to bring out the "R" word - that's right, Resolutions. I was thinking about the word itself. We're all very big on goals nowadays, but a resolution isn't setting a goal, or saying "I'll aim for x, y, and z." Resolution, according to my American Heritage Dictionary, is "a course of action determined or decided upon." It was the HMS Resolute, not the HMS Goal-Oriented (of course, that didn't stop it from getting trapped in the arctic ice and abandoned.) So what are the course of actions we've determined for the upcoming year? Fortunately for all of us, we didn't do this New Year's Day post last year, and so we are all spared spilling the beans on what we didn't manage to fulfill. (Full disclosure - I achieved NONE of my resolutions and actually reversed one of my 2016 goals by gaining back the twenty pounds I had lost that year!) So what will I tackle in the year to come? Besides trying to lose those twenty pounds for a second time? I resolve to manage my stress better. I want to make mindful prayer and meditation part of my daily routine. Another part of stress management is regular (joint-friendly) exercise. I will re-up our family membership at the local Y and start swimming again. I may also just keep on watching Hallmark Christmas movies all year - they're soooo soothing and uplifting. I resolve to not shut myself up in my house and hide. I will try to have lunch, or coffee, or see a movie with friends once a week, especially as the Smithie may be moving out of the house (finally) (Just joking, Smithie, you can stay as long as you like.) (But really, leave.) and Youngest, God willing, will be starting college at the end of August. I resolve to learn how to do some basic house fix-ups and landscaping chores, and I will buy the tools necessary to do them now I don't have men around. Seriously, I didn't know how I was going to reach the top shelves anymore when my cousin Ron bought me a folding step-stool. It has changed my life. I resolve to write, even if it means scrapping the work-in-progress and starting over. Geez, I hope my agent and editor don't read this. HALLIE EPHRON: Julia, your resolutions are awe-inspiring. Though when you wrote: "Another part of stress management is regular (joint…"
I read: "Another part of stress management is A regular joint…"
which made me think… well, never mind. JULIA: I do still have quite a bit of the medical marijuana prescribed for Ross. Maybe...? HALLIE: My resolution is to stay physically active and not become a couch potato. I stopped going to my exercise classes because my joints are wearing and I needed something less bouncey. Hoping gentle yoga is the answer. And regular walks. FINISH THE DAMNED BOOK! I am aided by the fact that my editor just went out on maternity leave and that gives me an extra month. So no excuses. Refresh and nurture some relationships that have sadly frayed in the past. And just be less judgmental. Good luck with that. HANK PHILLIPPI RYAN: Oh, gosh, I don't know. Jonathan and I were just talking about how easy it is to lose track of friends--everyone is so busy. So we agreed to try harder. To realize everything doesn't have to be PERFECT. That walking might be the solution to everything. And that even though you might be (briefly) trapped in the ice, that goal-oriented is good. As long as the goals are flexible. To be optimistic, and kind, and patient. Patient patient patient. (And not be inwardly critical. Yeah, that'll happen.) And persevere. But book will get written. I don't even have to resolve that, I think. It just will. And yes, as you said, Julia, we do not do politics here. But every day, I am going to chant: diversity, vulnerable, evidence-based...and etc. Ha. But I am not going to resolve to cut down on caffeine. Because..why? LUCY BURDETTE: Oh no Julia, please don't scrap the WIP--I feel certain the story is there and we're desperate to read it! DEBORAH CROMBIE: Yes, Julia, the JOINT is helpful for stress management, LOL. 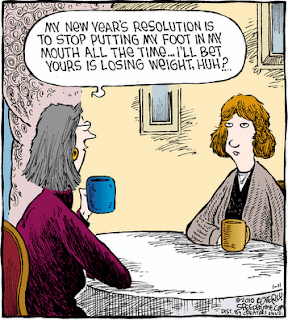 I am with you all on most of these resolutions. First, FINISH THE BOOK. Prioritize!!! I'm already spending so much less time on social media that I'm missing keeping up with friends, so it's hard to find a balance there. Be more organized. Make lists. Structure my time better. Go to bed earlier. Get up earlier. Read more. Make a list of what I HAVE read! Do my bit to improve our situation (vote, contribute) without letting the news distract me from everything that is good in my life and in my community. Pay attention to what's around me. And keep up my journals!!!! Oh, and become a better cook. (Um, have I gone overboard, here?) RHYS BOWEN: Oh yes, Debs: learn to say NO more often. How many times have I agreed to go and speak somewhere because it seems rude to say no. Then one day I wake up and realize I have to fly to DALLAS to give a speech at a luncheon. How ridiculous is that? So I will try to cut back on events this year. Only do things that make sense and bring me joy. That will be my main resolution: only do things that bring me joy. Life is too short to be stuck with boring and miserable tasks. Also: make enough time for friends and family. Take time for myself every day, just to drive to a nice view, walk on a beach, go have a massage, sit alone and drink a coffee.... just to rewind. Not worry too much about the state of our country and the world. Things will sort themselves out... but encourage everyone I know to vote! And most important: do something good every day, even if it's as small as telling the bank teller that you like her necklace or letting another car go first at a stop sign. But also telling my husband and family that I love them... and showing it. And making sure I laugh at least once a day. INGRID THOFT: I live in Seattle so a joint isn’t required. I can just inhale when I walk down the street! First and foremost: FINISH THE BOOK! But also, don’t beat myself up about the process of finishing the book. I’m a “control enthusiast,” as my husband likes to say, and I find it difficult to accept the messy reality of creating something. The starts and stops, false starts, and detours are part of getting to the final manuscript, but it's a challenge to go with the flow. I resolve to take the process as it comes. I’d like to get better at meal planning. Since I live right by Pike Place Market, I tend to take a European approach to food shopping and planning, but I think it would take less mental energy if I thought about it a week in advance. And yes, voting. We all need to resolve to vote! 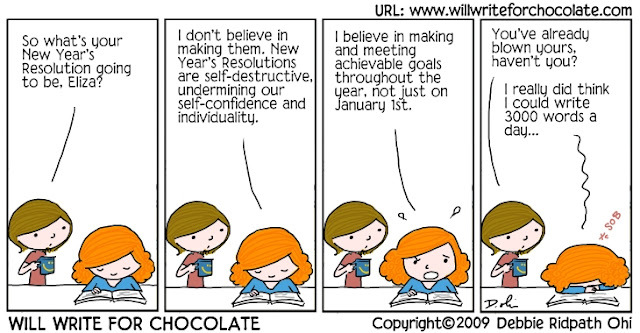 JENN McKINLAY: Resolutions. I love them. I love New Year's Eve more than any other holiday because I love the idea of the life do-over, plus, champagne and fireworks! 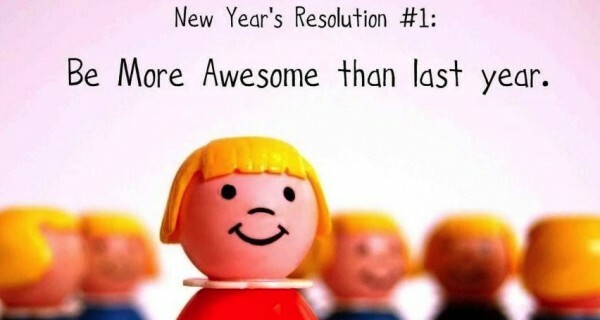 My resolutions are pretty simple compared to years past. For the longest time I had two resolutions -- be the best mom I could be and get published. Well, I feel as if I've accomplished those goals. While not perfect in either category, I can honestly say I've done my best. Now, that the hooligans are older and need me less and I've gotten published and have been encouraged to spread my wings and write whatever I'd like, I want to turn inward, slow down, breathe. The world has had me in a constant state of outrage for so long that it's become my normal state. I don't like it. It taints everything. So, while a walk through Seattle (LOL) would be helpful, I think I am going to try to be more mindful of what I can do - support candidates I believe in, vote, attend town halls and meetings, write letters, etc. - but also make the time to meditate, find joy in the small things, spend time with my family and friends, and to keep living my best life by treating it like the grand adventure that it is. JULIA: A grand adventure, indeed, Jenn. How about you, dear readers? What are your resolutions? Any suggestions for my joint stress management? 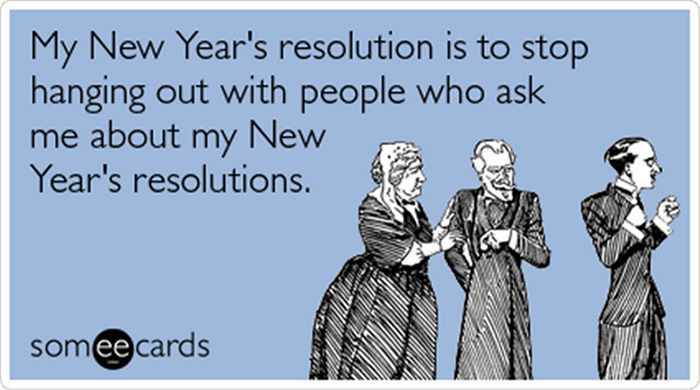 I’m not big on making New Year’s resolutions as my track record on keeping them is atrocious. But it’s fun to pretend I might actually manage to follow through on one or two . . . .
My family would cheer if I eliminated the word “seriously” from my vocabulary, so I will probably give that a try . . . but there are days that simply require a hefty dose of vocal sarcasm . . . . Cutting down on caffeine isn’t going to happen, either. I learn from my mistakes. Julia, I’ll join Lucy in hoping you don’t scrap the work-in-progress . . . and I must agree that watching Hallmark Christmas movies all year sounds like a marvelous idea . 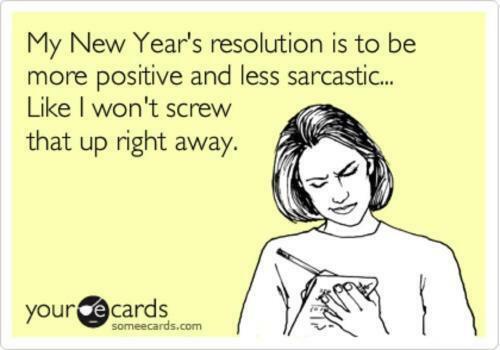 . . and that may be the only resolution I could actually manage to keep . . . . Right? I loved the Washington Post article which quoted a counselor: "It's either Hallmark Christmas movies or Prozac." I like those movies too and watched many of them during december but I' m not sure about " all year round ". Happy New Year! I am definitely glad to turn the calendar page and see what 2018 will bring. I am also not big on making New Year's resolutions but after my first full of retirement last year, I can assess what needs to be worked on. First of all, I need to RELAX! I am a pretty intense person and the type A personality does not know how to turn off. My main stress relieving method of taking long walks/hikes and cycling was thwarted by 3 different leg injuries last year. So I have to take better care of myself in 2018 so that I am able to burn off the stress/excess energy. Being a couch potato and reading 180 books in 2017 (including books by many of the Reds) was good but I was frustrated by how many books I did not get to read that are on my towering TBR mountain! I did enjoy my trips last year to Iceland and Hawaii but my wanderlust was not fully satisfied...so more travel in 2018 for sure. And being basically housebound the past 2 months has made me realize what a packrat I have become. So I have started to work on decluttering my apartment. Physical clutter is a sign of emotional clutter I am told. So I have already cleaned out the kitchen and bathroom and I do feel a lot better about not seeing the mess there. Tackling the 3 big closets are next on my list. And for the Reds, yes, please FINISH YOUR BOOK(S)! I like Rhys' comment about only doing things that bring joy since life is too short. But also be kind to yourself and then you will have an even bigger capacity to be kind to others...you are all already awesome but it's good to strive higher! I don't make resolutions. Never have. But of course I will write and exercise and vote. Julia--a series of easy stretches , sitting on the floor or lying down, can help a lot with joint pain. You can find the best ones for specific joints online (or email me--i have tips for arthritis in knees, ankles, hands, wrists, and neck) Then again, my nephew swears by hemp oil. As for the book, If you have an idea for something else and the enthusiasm to plunge into it, I say go for it. I don't know your editor but our mutual agent will understand. Thanks, Kathy! I'd appreciate any info on helping my knees. I do know swimming helps - when I was going to the Y regularly I had much less pain at the end of the day. I doubt I could keep any resolution that I should make so it is probably best to stick with trying really hard not to worry so much. I once had a friend who told me to "just put it in a bubble and let it go." If only. But I have found that walking does help. Only not today when it was minus 10 when I got up. Julia, does the Y have personal trainers? You could take a personal session to devise a workout routine, and then revisit once a quarter. Or water aerobics? My village fitness center has a heated therapy pool with a stationary bike immersed in it. Swedish death cleaning is my theme. My daughters pillaged the upstairs closets after Christmas and assembled fifteen bags of trash and donation items. What a wonderful feeling, until the temps went below zero and I needed blanket weight wool sweaters, which I found at the bottom of a plastic tub in my closet, not worn since we pulled out of Cleveland in 1993. Maybe I'll keep those, just in case. Margaret, they do! I've actually been thinking about it - you can pay for a single session, or a series of them. I love weight training, but I haven't done it since my knees started to get bad. A professionally-designed series of exercises would help me a lot. Like others, I want to lose again the weight that I lost in 2016 and found again in 2017. More exercise and portion control. Figure out what I'm going to do with what a friend calls "the third half of life." Be more mindful and learn to meditate without going off down rabbit holes quite so easily. Make new friends and keep the old. "...the first is like silver, the second is gold." Always enjoy reading what you ladies have to say. Hope to see some of you at Malice this year. As to resolutions, etc., well, may I recommend the 'walking'. Just the walking. I've focused on my health a lot since July - have lost 45 pounds - and exercise by walking - lots. At the end of 2017, my husband had a serious health scare (he's recovering), but I was so very grateful that the problem was found and surgery was completed and felt blessed that I had already started my health and movement quest. I coped much better. So, walking is excellent for your physical health and your mental health. And reading - lots and lots of reading or listening to audio books. Happy New Year!! Congrats, Kay! Keep us posted - you can be the inspiration for all the rest of us trying to get healthier in 2018! Work smarter, not harder--if I put my mind to it, I should be able to accomplish those goals that are important to me. That's what I need to remember. And Julia, whatever you write, we'll be eagerly awaiting the end result! Also--Julia and Halle--t'ai chi/qi gong exercises--there are a series of simple movements--even if you only do three or four of them--they slow me down and center my mind, help ease the stress and tension! Bon chance to all in the New Year--wishing you all peace of mind, good health, and joy! And the same to you, Flora! Realizing I forgot my #1 resolution: Read less news! It's toxic and addictive. I'm at a point in my life and my career when I need to start thinking about what comes next. Job changes? Retirement? How do I get there? I have some old stuff I need to wrap up, and still a boatload of boxes I need to unpack, and then comes the genuine decorating to make the house I live in look like the house in my mind. So that's what I'm going to try to focus on this year: realigning my time and priorities to set up for the next chapter. Hugs to you, Julia, for your courage. The year ahead will have a whole lot of potentially awful "firsts," but you clearly managed Christmas with style and grace. I believe in your strength to meet the rest of your challenges, even if it takes a whole year of Hallmark movies to get through it all. And, okay, maybe you don't scrap the WIP, but you probably have different stories you want to tell now, so don't be afraid to tell them. You've got this. Thanks, Gigi. It did feel great getting past Christmas. It's really helping that I'm moving into the home stretch of being able to put my needs first, with both my girls on the way out the door this year. Thanks, Ann. It is a thing of wonder and joy. Happy New Year Hugs to all the REDS and RED readers! Julia, I echo what Gigi said so well, and as she finished up, you've got this! Resolutions? Meditate and be mindful. FINISH THE BOOK! Exercise regularly (I'm thinking yoga this year, but I had done qi gong in the past and if I can find the book - it's great for balance and stress relief while being gentle on the body). Stay away from the news. Getting ready to watch the Rose Bowl Parade - anyone else joining me? This parade never disappoints . . . what great floats! I don't make New Year's resolutions, but I do like make to make a Vision Board for the new year; it's a really fun and meditative way of doing collage (the only way I can be artistic) and taking the time to ponder the coming year and how I'd like to use my energy. So far the words 'be kind' and 'read. think. write' figure prominently, as does the words 'friends'. I'm troubled by how hard it is these days to find/make time with friends; that's a must for me this year. Do keep writing, Reds. I'm ready to read anything you publish! Happy News Year's Day today...and the days ahead. Also, Julia: I shared your post from early November with a friend of mine whose husband died in March. Your words resonated with her, so thank you for that piece of writing. Anything you turn your hand to will be welcomed with gratitude. Thank you, Amanda! I'm glad someone else found some comfort from my writing. No resolutions here except the continuance of those things I do to keep my aged bones upright and moving: Daily walks with the dogs, difficult in this weather but when I can't walk, I take myself to that demonic cardioglider in the basement and just do it; no more carbonated diet drinks that elevated my potassium to the heart arrhythmia level, which I started last week after the second elevated lab value in a month, yech; continue avoiding TV news except for the weather and occasional national disasters; vote vote vote vote vote. Remember (not to be political or anything, because you all know I never do that) your vote has the greatest power and effect in local elections. And I will continue to declutter my life, closet by closet by basement by attic. 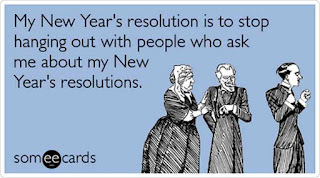 I don't make resolutions. I set goals throughout the year as my life changes. Sometimes I even attain them! An ongoing goal which I set a long time ago is to declutter. If you came to my home you would say to yourself "Really? This is the decluttered version of Deb?" But I have made progress in small areas that nobody can see. About the joint pain: my doctor recommended turmeric, added to food or hot drinks. I rarely remember to do it, but I told a friend about it, and she swears by it. DebRo, here's a link to recipe I've made for "Golden Latte" with turmeric. It's good enough that I made jars for friends as Christmas gifts. I haven't drunk enough yet to see if it really makes a difference, but I figure it can't hurt. I've also downloaded the Wellness Calendar from this blog, one I regularly follow. I am totally with you on celebrating progress nobody else can see. The only way I have ever figured out to tackle huge jobs like decluttering is to focus on one small space and get that done, then move on to the next. Sadly, because I wasn't very good at it when I lived in the country, I think I've moved a lot of my clutter here to the city, and have to get rid of it now. Don't be like me. Use me as the horrible example you wish to avoid. Get rid of the clutter now! And I'll keep telling myself, "If DebRo can do it, I can do it!" You can do it, Gigi! You're making progress!! Deb Ro, I’m a fan of arnica, crime, gel, or tabs. Turmeric will work but you have to consume half he amounts of it, possible if you’re Indian. Ann, I didn't think you were a fan of "crime", but then again, aren't all of us here fans of crime?! Debs, that recipe looks good! Buying and reading books is the work of angels, so keep doing that. Allowing yourself to recover is also important work, so do more of that, too. And here's hoping you don't have the problem I used to have: Warren would stack stuff on the stairs that he intended to take to his upstairs office, but it would never get farther than the stairs. One day, completely overwhelmed with all the clutter everywhere, I told myself I could at least clear one stair. When I did, Warren told me he was so inspired, he wanted to de-clutter his corner of the living room. Which he did. And stacked all the stuff he wanted to move to his office on the stair I'd just cleared off. Sometimes you can't win, but it's still worth the effort. My resolution is to sit down today and write down my resolutions... After I take down Christmas. Black-eyed pea soup is made and ready for later! As sad as I feel about taking down the tree and the Christmas things, I'm always glad to see how clean and uncluttered my house feels when the stuff is gone. A fresh start to the year! First, I have to say how much I enjoyed the cartoons in the post this morning. Starting the day and the new year with chuckling is as good as it gets. Of course, starting the day with Jungle Reds always sets a positive tone for the day. 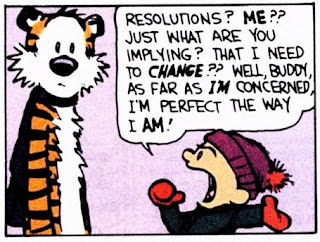 I'm not too big on resolutions for the New Year. However, I know that I have got to lose weight for healthy reasons, including my joints. I have had a problem with my left leg the last couple of months and been going to PT for it, but water therapy is recommended, too, and the end of last week I joined the Y so I could start that and maybe check out other programs or resources there. My husband is retiring next summer, and I'm planning on us hitting some walking trails. For a Christmas present to both of us I presented him with retractable walking poles. Of course, I need to start walking again before next summer. But it's so cold right now. Brrrrrrrrr! Here is something I picked up off of FaceBook that resonated with me, and I felt it was a great way to start the new year. "I'm walking into 2018 with a clear heart and mind. If you owe me, don't worry about it - you're welcome. If you wronged me, it's all good - lesson learned. If you're angry with me, you've won - I let it go. If we aren't speaking, its cool - (I wish you well). Life is too short for all the pent-up anger, holding of grudges and extra stress or pain. Let that s*** go." You are right about everything Kathy. Ann, I may want your statement in writing to give to my husband. Hehehe! Our family used to have a full ritual of resolutions -- and I have the papers saved from about 1978. But now we are scattered -- and I am getting older, and so -- change. For Christmas this year I did some sewing -- ornament gifts and doll blankets & pillows for the granddaughters. I want to do more of that kind of activity -- I'm going to make the dolly stuff for my Cape Cod Parish's Strawberry Festival. And maybe I will write again. Certainly I will read. Thank you, writers!!! I need to resolve to take up some gentle exercise. My balance is so bad when I exercise that I've become very sedentary. Several people have recommended gentle yoga. Now to do it! I worked with a physical therapist this fall on balance, and it was wonderful. I agree with Denise about PT and balance benefits. What I love about the physical therapist I'm seeing is that I went in for my leg/hip/back problem, but what he's doing and the exercises he's giving me are helping balance as well. Red not ted. I’d like an edit option here please. I have such a horrible track record with resolutions that I gave up making them several years ago. But reading everything here makes me want to try again. So, I'll start with small steps: drink more water and eat a salad every day. I also like the idea of consuming less news. Love your "finish the book" resolutions. I'm all for that since I want to read them! I'm going to continue my resolution to use a word to motivate me in much of what I do. The word? PROACTIVE. It sure got me out of a lot of ennui and disengagement last year. I'm the one who guides my life so if I want something, I must be proactive. Happy new year to all. I make just one resolution a year, and it's always something fun (and, as a result, I keep it!). For 2018: reread the Harry Potter books, in order. Happy New Year, everyone! I took down the tree yesterday so that today would truly feel like a fresh start. I wish I lived near those of you who are sorting and chucking stuff; I love decluttering projects! Ingrid, you can visit anytime! Ingrid, if you ever want to visit a frigid winter wonderland, I could always use an enthusiastic helper in my decluttering efforts! When I saw the word "joint" it made me think of a bar. So, a regular hangout place. Which I guess would have a similar stress-reducing (or stress-making) effect. The new year started here with donating three huge bags of coats, hats, scarves, socks, gloves, and sweaters to the homeless here in Cincinnati. A man froze to death last week, which is truly horrendous. A friend is helping to organize collection of warm clothing, and I was happy to contribute. She is also an aspiring writer, so I gave her an older netbook computer that I just found when I was clearing out stuff last week. I was delighted to help her in that small way. Decluttering, and clearing out before we move next year, is a top priority. I wouldn't have considered that a resolution, but under your definition, Julia, it is. I am resolved to move as little into the new house as possible. And to that end I'm also resolved to spend as little money on new stuff as I can, too. Unlike Hallie, I have become a couch potato, especially in the cold weather. There's really no excuse, either, because under my Medicare plan I have access to Silver Sneakers at the Y for free. So I need to get off my tush and get moving. That's about as far as I'm prepared to go, with spoken-out-loud goals. I already vote and am already outspoken, and will continue to be so, whether it's popular or not. I just hope we all end this coming year happier and more joyful than we've begun. By the way, Hank, what appetizer did you end up taking to your party? Hope you had a fun evening. Julia, sending good wishes your way for an excellent year in 2018. About the turmeric: we take Jarrow Curcumin Phytosome, and love it. (Curcumin is the active part of turmeric). Be sure to take it with food that has fat in it (cheese works well). If you Google Curcumin, lots of clinical studies will come up. We're also big on swimming and walking. SO behind! AH.. Seriously. Know what I did today? Signed my new years cards. For which the printer has not yet sent the envelopes. SOMEBODY needs to make a new resolution, and it ain't me. Hank, all that sounds wonderful and way harder to assemble than the sausage rolls I made. When you’re ready, Julia, lunch is on me!